I was wondering if anyone knew what kind of flower this is? Thank you in advance, I've been trying to find out for a while. It looks like a rose to me, one that is finished blooming. It's hard to be 100% sure, though, without seeing the plant it came from. A rose is a rose is a rose!. Could be a dahlia also! I would have said rose also, but if we are going for possibilities, another possibility is peony. As people have said it is hard to be sure without seeing the plant. But if this is a recent picture of a recently bloomed flower, that reinforces the rose idea. Lots of roses are fall bloomers, even winter bloomers in warmer climates. Magnolias and peonies are spring bloomers. It was a rose. It's just the petals that broke off but it still kept its shape. Could this be a certain kind of rose because she isn't giving me any further information about this rose. could this be a Rugosa hybrid? 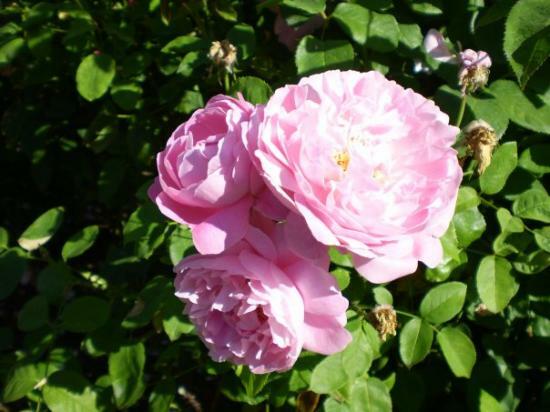 or a shrub rose? Just throwing this one out there, I really have no idea. It appears to be what I've always known as a "cabbage rose", but if you're asking for a specific variety name, I'm not knowledgable enough about roses to help you. Sorry.